It's late afternoon and Liu Chao is slouched in his chair after a long meeting when one of his longtime smoking buddies comes to his desk and asks if he wants to go outside for a cigarette. As in most office buildings in China, they used to smoke in the stairwell, but since Beijing instituted a ban on indoor smoking last June, they've had to start going outside. This time, though, Liu shakes his head and pulls an e-cigarette from his desk, quickly attracting a ring of other former smoking buddies, each with his own e-cigarette in hand. For a few minutes they stand around, indulging in their regular water cooler talk about work and life as they exhale intoxicating swirls of vapor into the office air. It was in January of last year that the 29-year-old, who works at a financial company in Beijing, quit smoking after 14 years, and turned to e-cigarettes. "With the smoking ban, more and more places didn't allow indoor smoking, like my office or any shopping mall, so it became incredibly inconvenient to smoke cigarettes, and I decided to quit," Liu says. "Besides, e-cigarettes are healthier and more stylish." Though the Beijing government previously issued other restrictions on smoking, the June ban was the toughest yet, forbidding smoking in any public indoor spaces, with penalties for violators that could run into the thousands. Despite the failure of previous measures, this time, the ban seems to be working, and one of the results - in addition to cleaner indoor air - is the rise of e-cigarettes, battery-powered vaporizers that provide users with a hit of flavored nicotine aerosol whenever they inhale. "Many smokers are turning to e-cigarettes as a way to help them quit smoking," says Wang Yang (pseudonym), the owner of one of the largest e-cigarette stores in Beijing. Wang prefers to remain anonymous as the country's policy on e-cigarettes is still not clear. "You also see a lot of young people in China picking up e-cigarettes because they think it's fun making shapes with the vapor, and because of the variety of favors, and the different styles of pipe." 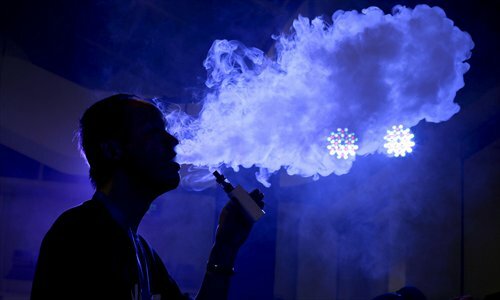 Wang says that he ironically first got wind of e-cigarettes' growing popularity when, after the smoking ban, his store's sales dropped 40 percent - that's because the store's competitors suddenly increased from five to around a hundred, as entrepreneurs scrambled to take advantage of the growing demand for e-cigarettes. Just one month after the smoking ban was implemented, the number of e-cigarettes for sale on Taobao grew over 6 percent, the Beijing Morning Post reported in July last year. Liu started smoking when he was just 15 years old and by the time he finally quit, he was smoking two packs a day. For years, his family tried everything they could to help him quit, from nicotine patches to early-generation e-cigarettes, all to no avail. Liu blames his failure on the fact that early e-cigarettes tasted awful. "But in recent years, I started wanting to quit, because more places don't allow smoking anymore, so it's very awkward when I get a craving," Liu said. "I remember one time I was having dinner with my friends and I got a craving, but the restaurant didn't allow smoking, so if I wanted to smoke I would have to leave the table and go outside, which is rude." China's smoking culture is also changing now, according to Liu. In the past, when he met with clients, they would usually talk business over a few cigarettes, but he said now he finds that more and more of his clients don't smoke in business meetings. "Maybe that's partly because the office doesn't allow smoking anymore, but anyway, I don't have to tell myself I am smoking for work anymore," Liu laughs. Fourteen years of smoking took its toll. Liu says his fingers turned yellow, his sense of smell became less sensitive and he felt perpetually that there was something caught in his throat. He had already decided to quit when he saw an ad for e-cigarettes online. He went to a store to try them out, and became a regular user. "There are so many different flavors, they're even better than traditional cigarettes," he said. "I like the fruit and tobacco flavor the most." Another perk is that e-cigarettes contain features to help smokers wean themselves off the active drugs in cigarettes. "I can choose liquid with different quantities of nicotine, which can satisfy my cravings and help me reduce my dependence," Liu said. These days, Liu rarely smokes traditional cigarettes anymore, and most of the time, he uses liquid with only 3 milligrams of nicotine, and sometimes even zero. Wang said that 80 to 90 percent of the clients in his store are smokers, and that 30 percent quit once they try e-cigarettes. Another 50 percent replace a portion of their smoking with e-cigarettes, and 10 to 20 percent give up e-cigarettes in the end. Besides health considerations, many users are attracted to e-cigarettes because they're hip. Many celebrities have been spotted using e-cigarettes in recent years, ranging from Leonardo DiCaprio to American comedienne Lily Allen. In 2014, Oxford Dictionaries even announced that "vape" - the verb for smoking an e-cigarette - was its word of the year. As such, e-cigarettes have been embraced by a new generation who were never smokers in the first place. "They mainly see it as something fun," Wang said, adding that these clients make up 20 percent of his total customer base. Zhang Gang, a university student, is one such enthusiast. He's not a smoker and only smokes e-cigarettes with zero nicotine. "With e-cigarettes, I don't have to put in much effort to create a huge amount of vapor and blow out different shapes. It's cool." He said he and his friends often attend exclusive vaping parties hosted by e-cigarette vendors, which sometimes draw hundreds of attendees. Wang said he also sees some customers who originally collected military knives, and now collect tobacco pipes with high-tech designs. Although e-cigarettes are gaining popularity in China, the customer base is still relatively small. This compares to the US, where, according to a Reuters report in June 2015, around 10 percent of adults vape. "I estimate that in China it could reach 2 percent at most, and only in big cities like Beijing, since you rarely see people smoking e-cigarettes on the street like in the US," Wang said. Another hurdle for Chinese vapers is concerns about the safety of domestic e-cigarettes. On zhihu.com, a user named Maodawang, for example, said he quit e-cigarettes after trying them out for a short time because they didn't taste like real cigarettes; they made him thirsty and he worried that they may have hidden health hazards that doctors haven't discovered. "The liquid used in the e-cigarettes produced in China is generally not of good quality, and may be harmful to the body," says Liu. "I even heard a report about an e-cigarette exploding. That's why I only buy ones from the US." Imported e-cigarettes aren't cheap though; Liu estimates he spent around 35,000 yuan ($5,376) last year on vaping alone. "If Chinese companies can improve their product quality and e-cigarettes are proven not to be harmful, I think more people here will accept it."